UPDATE: there are two really fun new features that you can only get with iOS 10. First, you can send balloons and fireworks etc. in a text message, like in the Apple commercial. Second, your iPhone (or iPad) will make these sensational mini-movies called “Memories” for you from your pictures and videos, and they’re really fun. Now that iOS 10 has had a few updates, and considering these two great features, I say please do upgrade to iOS 10. Executive Summary: I usually advise waiting for at least one update to come out before upgrading operating systems, but iOS 10 appears very, very polished. If your iPhone or iPad is on 9.x already, go right ahead and get iOS 10. Be sure to back up first! To install, go to Settings, then General, then Software Update. You will have to agree to Apple’s terms a couple of times along the way so pay attention and don’t leave the installation hanging, waiting for confirmation from you. UPDATE: T-Mobile put out a Tweet two days after iOS 10 was released, recommending that T-Mobile customers with an iPhone SE, an iPhone 6, or an iPhone 6 Plus NOT install iOS 10, because some T-Mobile customers with those phones have been losing their connections to the T-Mobile network. The short-term fix: restart the iPhone whenever it loses connection. Note that it’s only those three iPhone models, so if you have some other model you are probably fine. I would expect Apple and T-Mobile to have this fixed shortly anyway. iOS 10 came out September 13th, 2016, and I was quick to install it on my iPhone 6S (for testing purposes– it’s my job). I used the “OTA” method (Over The Air) and after accepting the terms, and downloading the installer, I thought I was done… but then I got the dreaded “connect to iTunes” message on the iPhone’s screen, signifying a failed installation. Note: there were multiple reports on the internet of OTA iOS 10 updates failing the same way mine did. Apple recognized the problem and fixed it within an hour. As long as your iPhone is backed up you should not be worried about installing iOS 10 over the air. After connecting to iTunes with the USB cable the system updated properly and everything is fine. In fact, during the time spent updating via iTunes, Apple fixed the over-the-air problem, so had I waited a few minutes before attempting my OTA upgrade I would probably have had no trouble at all. I upgraded an iPhone 5, an iPhone 5S, and another iPhone 5S over the air and those upgrades went smoothly. Yours will probably go smoothly too. So why upgrade? For the new and improved features. Messages is a lot better, Notifications is a lot better, Mail is a little better. 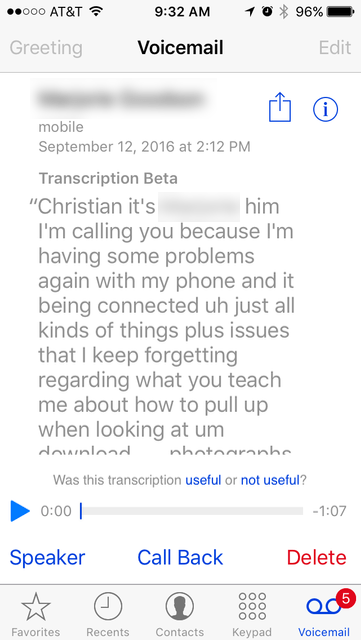 Voicemail now transcribes messages. 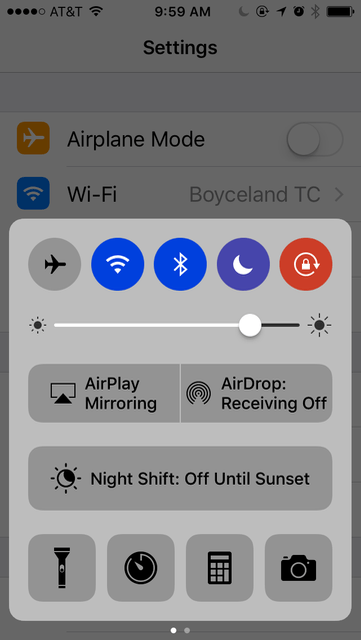 In Settings they’ve used color to make things more clear. Scrolling through a number-picker as you would when setting an alarm now goes tickety-tickety-tick, so it sounds like (and feels like) a “real” thing. Lots of little improvements add up to a nicer experience in daily use. iOS 10 is an upgrade worth doing. iOS 10 Notifications– swipe left and right (two panels). Also swipe down and up. You can read all about upgrading to iOS 10 on Apple’s “Update to iOS 10” page. The basic steps: back up, download, install. Don’t skip Step 1. And make sure the battery is charged up before upgrading. I like to have my device connected to power while doing it, just to make sure. You will probably notice a lot of app updates waiting for you after the iOS 10 upgrade completes. That’s because a lot of apps were updated to make use of new features in iOS 10, but they couldn’t install themselves ahead of the iOS 10 upgrade. Those using iPhone 6S and iPhone 6S Plus devices (along with iPhone 7 devices) should look for opportunities to use “Force Touch” (a hard press) as many apps have added that feature. Try it on the Mail icon (quick access to various functions), on Calendar (shows your next appointment), on Notes (make a new note or checklist), and on Maps (send my location), just to name a few. did you notice any change in performance on the iphone 5s? Does everything still run quick and smooth? My iPhone 5s does feel a little sluggish under 10.0.2. Of course it’s not going to keep up with my iPhone 7 but even without comparing the two, the iPhone 5s feels just a little slower than I remember on 9.3.5. I notice though that it gets faster with time– that is, opening an app the first time is slower, because it has to load, while subsequent times it just “wakes up” as long as you don’t flick it and quit it. So any test we do, we should do multiple times.